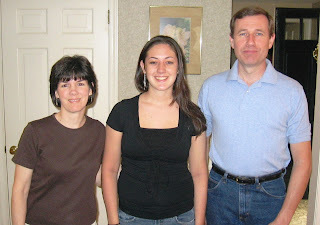 In July 2007, the Horsham Lions Club presented $1,000 scholarships to three seniors, and $2,000 to one senior from the Hatboro Horsham High School, totaling $5,000 in scholarships. The club strives to present several scholarships to local students each year, in an effort to assist in furthering the education of community-minded young adults. The students were chosen anonymously, and the choice was made not only on academic merit, but on the level of community and humanitarian involvement the students displayed. Since beginning the scholarship program, the Horsham Lions Club has presented more than $135,000 in scholarship money to local students. Kaitlyn Doherty (above, center) will be majoring in Fashion Design this fall. She’s been the president of the Future Business Leaders of America chapter in Hatboro Horsham High School. She’s also served on the Student Advisory Board, and been inducted into the National Honor Society and the National Art Society. She’s been active with Field Hockey throughout her high school career. Kaitlyn has volunteered for the Food Bank, Juvenile Diabetes, American Cancer Society, and helped make handmade blankets for hospitalized children. William Rech (above, left) will be attending Penn State this fall, majoring in Accounting/Finance. He also was a member of the Future Business Leaders of America, as well as a member of the National Honor Society and the Student Council. He was in the Math Club and the Class Advisory Board. Bill has been very active in sports, including golf, basketball, track, and volleyball. He volunteered at the St. Catherine’s Carnival, as well as a Lions fundraiser. He’s been a track official for a Kiwanis track meet, and has attended a Rotary leadership camp. Anthony Visconte (above, right) will be attending West Chester University this fall, majoring in Music Education. He’s a dedicated musician who wishes to bring the joy of music to all. During high school, he was involved in basketball and tennis. He’s been on the Student Advisory Board, Student Council, and has also been a senior mentor. He was involved in symphonic band, concert band, and choir. He’s volunteered with the St. Catherine’s music ministry as well as their Vacation Bible School program. Colleen Cunningham (below) will be attending Gwynedd Mercy College or Drexel University this fall, majoring in Nursing. She’s president of the Key Club, a community service organization, at the high school. She’s also a member of the National Honor Society and the Future Business Leaders of America. She’s been active in her church youth group, and has been taking dancing classes for 13 years. Mr. Rech received the sole $2,000 scholarship, which was named in memory of Max Hankin (deceased), longtime Horsham entrepreneur and participant in the Lions Club. He and his wife Janet (also deceased) have helped the Lions in our cause by permitting use of their property to park cars during air shows. Without their support and the support of their family, scholarships such as these would not be possible. Please join us in congratulating these students and encouraging their continued growth! Leonard Ferguson, a long-time former member of the Horsham Lions Club, passed on July 11th in Burlington, NC at age 87. Leonard left Horsham in 1982 when he retired to North Carolina. Leonard was born in Hastings, Nebraska. He was an accomplished piano player. He was married for close to 70 years to his wife Riva. Leonard received a Masters degree in History from University of Nebraska 1948. That same year, he moved his family to Philadelphia, and entered the PhD program for History at the University of Pennsylvania. Shortly after that, he left the PhD program to become executive director of what is now known as the College Settlement Camp in Horsham. He remained director until 1982, for a total of 34 years. The College Settlement Camp offers overnight camping for economically needy children from the five county Philadelphia region. It also has a day-camp, which serves kids from targeted schools in Philadelphia. His influence on the camps and on Horsham is immeasurable. Leonard has been a member of Lions clubs, the Monarch Club of Philadelphia, the American Camping Association, and the Upper Dublin Friends Meeting association. Since retiring to North Carolina, he remained active in Lions as well as in the Masonic Temple. His wife Riva passed in April 2006. He later moved to a retirement community, where he was in constant demand to perform on the piano for his friends and neighbors. A memorial service in Horsham is planned but not announced. Details to come. Please let Andy Weiss know if you’d like to contact his son via email. Not a week after his passing, his son felt it necessary to inform the Lions; and he has been gone from Horsham for 25 years. We’re flattered that his fondness of our club has remained so strong for so long.